Onion skins will dye wool or other animal (protein) fibres. If a larger quantity of wool is to be dyed, increase the quantities proportionally. All weights given are relative to the dry weight of the wool. Safety is important. Wear a dust mask, eye protection, and rubber gloves when dying. 1. Weigh the wool. Skeins of wool are tied loosely in several places to prevent tangling. If your wool is purchased in a ball, you will have to wind it into a skein before dying it. and gently squeeze out the excess water. Use lukewarm water and avoid sudden changes in the temperature of the water which cause the wool to felt or mat. 3. Next the skein will be mordanted. Dissolve the alum and cream of tartar in a little hot water and then add this solution to cool water in the mordant pan (you can use your dyepot). Immerse the wetted yarn and then place the pan on the heat source. Slowly raise the temperature to 82°C (180°F) and simmer for 45 minutes. Leave to cool, then remove the wool and rinse well. 4. 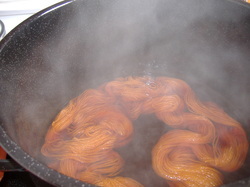 To prepare the dyebath, place the onion skins in the dyepan and cover them with water. Slowly heat the dyebath to boiling point. Simmer for about 45 minutes by which time all the colour should have been extracted from the onion skins. Remove from the heat, allow to cool and then strain off the liquid from the skins. Yarn after reaching the correct temperature. darker when wet than when dry. Remove the wool from the dyebath if no further uptake of dye is required, or allow the fabric to cool with the liquid in the dyebath. Do not cool quickly with cold water. 6. When the skein of wool is cool, rinse it thoroughly in several changes of water until the water is clear, then wash the skein of wool in soapy water, rinse and allow to dry. 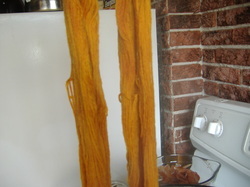 I was able to dye a second batch of wool. This is merino lace-weight. I chose not to mordant it as I did not want such a vibrant shade. 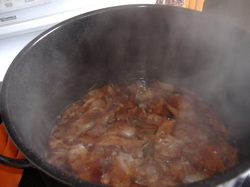 Onion skins do not need a mordant to be color-fast, but mordants are used to get different shades. Depending on the mordant used, yellow-skinned onions will yield burnt and bright orange, yellow, brass, and brown colors, while red-skinned onions will yield reddish-orange, pink, salmon, gold, tan-brown, and dark tan dyes. 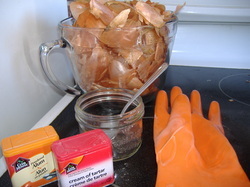 Onion skins will produce a beautiful orange color with alum. 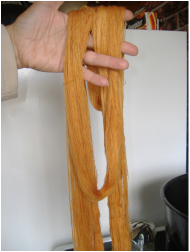 It must be noted that dyeing should be done in a non-reactive (non-aluminum) pot that is used exclusively for dyeing. My pot is an enamel 20L (21qt) pot. It was sold as a canning pot.